The resistance of a group of refugees against the eviction of an occupied school building in Berlin is exemplary of migrant struggles across Europe. For eight days, a small group of about forty refugees from different but mostly African countries have been occupying the roof of a vacant school building in Berlin’s Kreuzberg neighborhood. The former Gerhart Hauptmann School on Ohlauer Strasse had been home to more than two hundred people since October last year, ever since a nationwide wave of refugee protests culminated in a six-hundred kilometer long protest march from the Bavarian town of Würzburg to the center of the country’s capital, Berlin. The refugees first set up camp at the central Oranienplatz, and later moved on to occupy the vacant school building where they were holding up, awaiting the slow processing of their asylum applications. The stand-off between the police, who have sealed off the neighborhood on several occasions during the last days, and the activists inside and outside the building continues. Throwing all feigned neutrality overboard, Berlin’s police union has openly pressured the local governor to give a green light for the eviction of the remaining occupiers. But while the area has been sealed off by 1,700 police officers, some armed with machine guns, there has been a great show of solidarity from neighborhood residents who have been breaking down barricades, as well as students and teachers who today launched a strike in support of the refugee struggle. In a statement released by the refugees, they claim that the police have been depriving them of their sleep by banging on the doors and making statements in the middle of the night in an attempt to break their resistance. More shockingly, the refugees allege that the police has insulted them in more overtly racist ways as well, waving bananas at them from nearby rooftops. 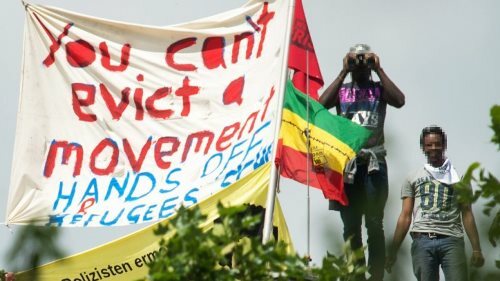 Under the slogan “You can’t evict a movement”, the refugees have been demanding the closure of Germany’s refugee camps, a halt to forced deportations, and the abolition of the mandatory residence permits that inhibit their freedom of movement. The occupation of the Gerhart Hauptmann School is just the latest in a series of migrant and refugee struggles across Europe. Some of the most recent and most publicized cases include the resistance against the eviction of the tent camps in Calais; the migrants in Italy who sewed their mouths shut to protest against their poor treatment by immigration officials; the popular protests against racist attacks in Greece; the unrest surrounding the treatment of thousands of asylum seekers in Hamburg; and the Vluchtkerk (“Refugee Church”) in the Netherlands. Refugees, immigrants and asylum-seekers coming to Europe are faced with increased threats and hostility from governments and society alike. Through populist media and right-wing political discourse they are depicted as parasites and bloodsuckers free-riding on “our” national wealth, without contributing anything. This kind of racist rhetoric is unfortunately characteristic of and inherent to a global economic system where capital and commodities move freely across borders, while new walls are being erected everywhere to halt the resulting flows of human beings. In times of crisis the “Other within” is an all too easy scapegoat for those who try to divert attention away from the real causes of the problems at hand. Europe’s racist and antagonistic attitude towards the pleas of those who flee warzones, torture and execution, or towards those who are simply in search of a better life elsewhere, has become so widespread and generally accepted that even those political parties that originated from the Left are now actively partaking in the witch hunt against everyone who looks or sounds foreign. In Berlin, it is the Green Party that heads Kreuzberg’s local government and that today gave the order to evict the occupied school. Latest updates on this story can be found at Revolution News’ website, or by following the hashtag #Ohlauer on Twitter. Joris Leverink is an Istanbul-based freelance writer and an editor for ROAR Magazine. You can follow him on Twitter via @Jorislever. Posted on July 2, 2014, in Europe and tagged Germany, Immigrants, Refugees. Bookmark the permalink. 1 Comment.